Dr. Black has had continual peer-reviewed funding since 1986. Her research focuses on the cognitive sequelae of stroke and stroke recovery, the differential diagnosis of dementia, the use of neuroimaging techniques to elucidate brain-behaviour relationships in stroke and dementia, and more recently, imaging-genetics correlations. Her funding sources include the Alzheimer’s Drug Discovery Foundation, Brain Canada, Canadian Institutes of Health Research (CIHR), Heart and Stroke Foundation of Canada, National Institutes of Aging and Weston Brain Institute. She is conducting prospective studies on the utility of quantitative structural and functional imaging in diagnosis and monitoring of mild cognitive impairment, Alzheimer's disease, vascular dementia, frontotemporal dementia, and Parkinson’s-Lewy body disease, and on the interactions of Alzheimer's disease and cerebrovascular disease. She is also an active clinical trialist with experience in more than 60 clinical and pharmaceutical trials. She is leading multicentre Canadian trials using amyloid imaging in patients with Alzheimer’s and Parkinson’s disease with moderate to severe white matter disease. In these trials, she is using ocular biomarkers, genetics, multimodal magnetic resonance imaging and neuropsychological testing. She is also concluding a repurposing trial of angiotensin receptor blockers versus angiotensin converting enzyme inhibitors in hypertensive patients with Alzheimer’s disease. As of June 2016, Dr. Black has over 470 publications (403 peer-reviewed), a Scopus H-index of 72, Google Scholar H-index of 89 and 28,726 citations. Over the last 25 years, she has led multidisciplinary research teams in studies of stroke and dementia. She has mentored many young faculty and trainees, including 36 postdoctoral fellows, 18 PhD students and 15 master’s students, earning outstanding mentorship awards from U of T’s Institute of Medical Sciences and department of medicine. 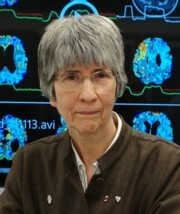 Her CIHR-funded multidisciplinary, multimodality longitudinal study of 1,279 patients with Alzheimer’s disease and other dementias has investigated brain-behaviour relationships, particularly the role of small vessel disease, and the utility of neuroimaging for diagnosis and monitoring treatment response (including 170 patients followed to autopsy). This invaluable archive has generated and contributed to 191 peer-reviewed publications in high-quality journals with trainees as first authors on more than 70 of those. These include reports of novel gene mutations in frontotemporal dementia and Lewy body disease. Since 2012, Dr. Black has served as the executive director of the Toronto Dementia Research Alliance. Since 2013, she has been a co-principal investigator and member of the executive committees for the Ontario Neurodegenerative Research Initiative and Canadian Consortium for Neurodegeneration and Aging (CCNA). She is also theme co-lead with Dr. Mario Masellis on clinical cohorts and clinical trials for CCNA. Starting in 2014, Dr. Black has served as vice-chair of the Alzheimer's Association International Society to Advance Alzheimer Research. Since 2001, she has served on the executive and scientific conference planning committees for the International Society for Vascular Behavioural and Cognitive Disorders. She is a member of the executive, steering and data publication committees for the Alzheimer's Disease Neuroimaging Initiative. She also serves on the Ontario Stroke Network, the governing body of the Ontario Stroke System. She was head of the neurology division, department of medicine, at Sunnybrook from 1995 to 2006, and medical director of the Regional Stroke Centre for North and East Greater Toronto Area within the Ontario Stroke System from 2001 to 2012.